Fall is in full swing and Halloween is near. These days, folks can celebrate with Martinelli’s apple juice and sparkling cider all year round, but in the past it was a more seasonal celebratory beverage. Fall kicked off the holiday peak season for our company and set the pace for the holidays to follow. Fall is in full swing and Halloween is near. At Martinelli’s, we like to have a special celebration this time of year, which usually involves dressing up and throwing a potluck with our workfellows. Seeing a superhero and a monster toasting with a bottle of sparkling cider never gets old! These days, folks can celebrate with Martinelli’s apple juice and sparkling cider all year round, but in the past it was a more seasonal celebratory beverage. 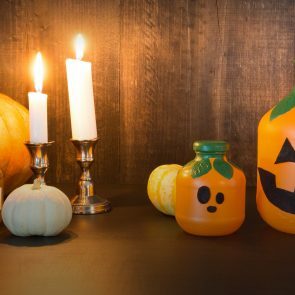 Fall kicked off the holiday peak season for our company, and Halloween became a popular theme in Martinelli’s advertising once October arrived. This excitement set the pace for the holidays to follow, including Thanksgiving, Christmas and New Years Eve. The fall celebration gained popularity in local grocery stores around 1933, after the invention of the golden apple bottle. Paired with the slogan “Drink Your Apple a Day,” which was created by Stephen G. Martinelli Jr., grocers began creating elaborate displays. During WWII, the company had to briefly discontinue the bottle due to supply shortages. It was later brought back in the 1950s, and grocers didn’t miss a beat. This time, they got even more creative as some of their displays would reach the ceiling! Such risky displays are no longer seen in stores, but back then it became a competition to create the most outstanding apple bottle tower. To pair it with the Halloween season of frightening costumes, Martinelli’s would provide promotional party masks with a cider purchase. Halloween ads also showed up in larger form. Here a snap shot of a bus in 1950s Oakland features an advertisement of another scary Halloween witch, treating her apple cider like a witch’s brew. These photos show the union of two age-old traditions. This “bewitching beverage” has long been associated with Halloween celebrations, especially when served hot in the cool fall weather. For decades, families and friends have dressed up for costume parties while bobbing for apples and drinking cider. 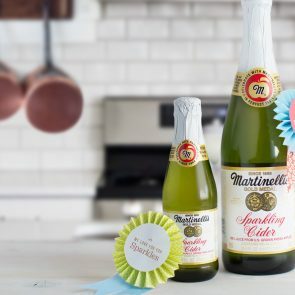 It brings Martinelli’s great joy to be a part of these memories with our sparkling cider and apple juice products. From all of us at Martinelli’s, we hope you have a fun and safe Halloween! 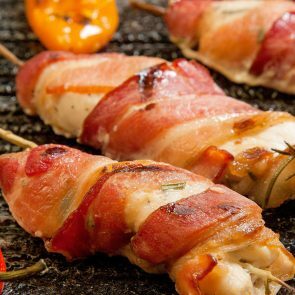 Scott's Scrumptious Barbecued "Armadillo Eggs"